Put chickpea flour in a bowl. Add salt and carom seeds. 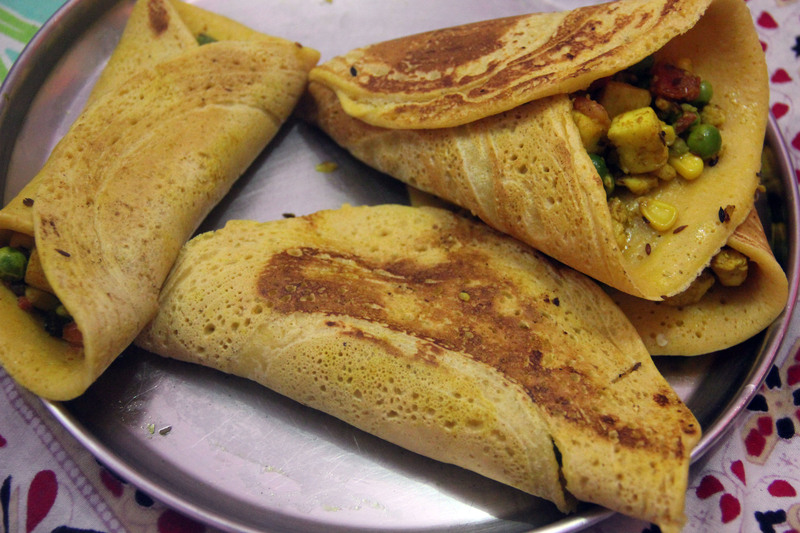 Then, add water, little by little, and whisk to make a smooth dosa like batter. Heat 1 tbsp oil in a non stick pan and add cumin seeds. When the seeds begin to splutter, add the green chilies and coriander powder. Toss in tomato, corn, peas, and paneer. Add salt and mix well. Heat until cooked. Heat a skillet, and put a little oil on it. Pour a little batter and spread into a round pancake. Cook till the underside is light brown, then spread a little filling over the pancake and fold it. You can fold it any way you want. I folded pancakes into various shapes – a half circle, a cone, and a roll. Take the pancake off the skillet, and serve hot.